I’ve managed to get another sewing related injury, an attempt to make an eyelet hole larger with a pair of scissors turned into a (literally) bloody disaster. I can’t seem to hand sew without the use of that finger, and apparently I can’t draft a pattern without banging it on everything. Between stabbing myself with pins, burning myself with irons, and seam ripper/scissor related injures i’m a battered mess. For a hobby people associate with the weak and elderly it’s pretty badass. 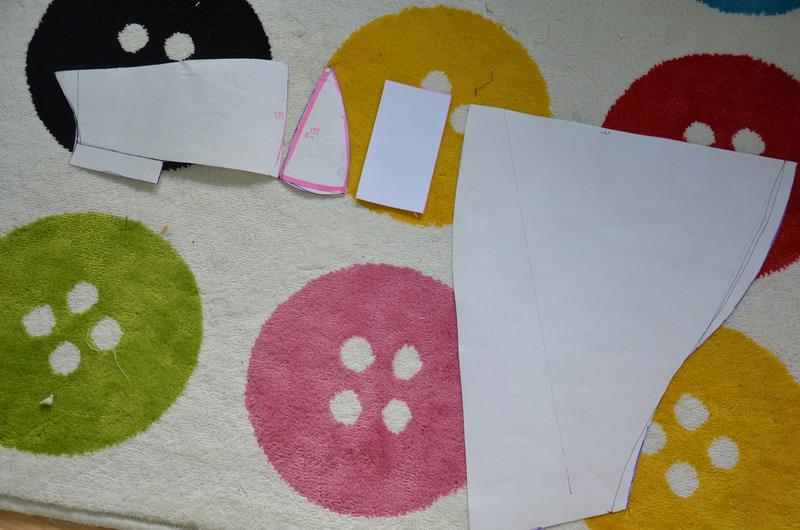 Anyway – I’m spending my accident educed absence from sewing by catching up on writing, I have six blog posts (mostly) written already – I’m super proud of myself. 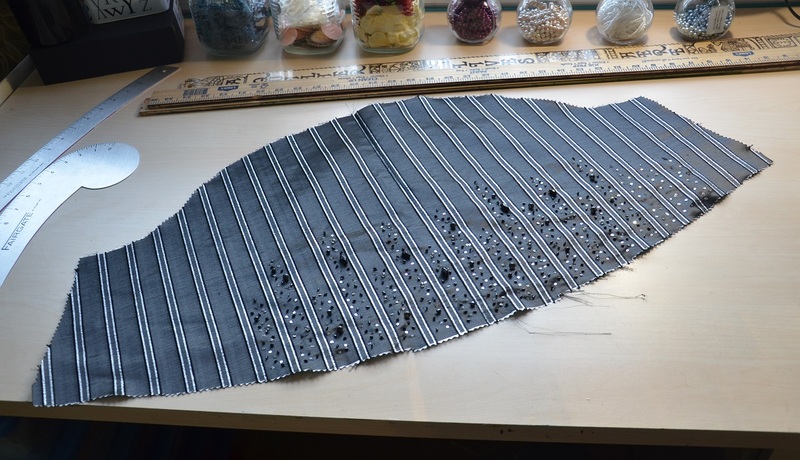 Enough with crap you probably don’t care about, this is part two of my overly complicated striped dress! 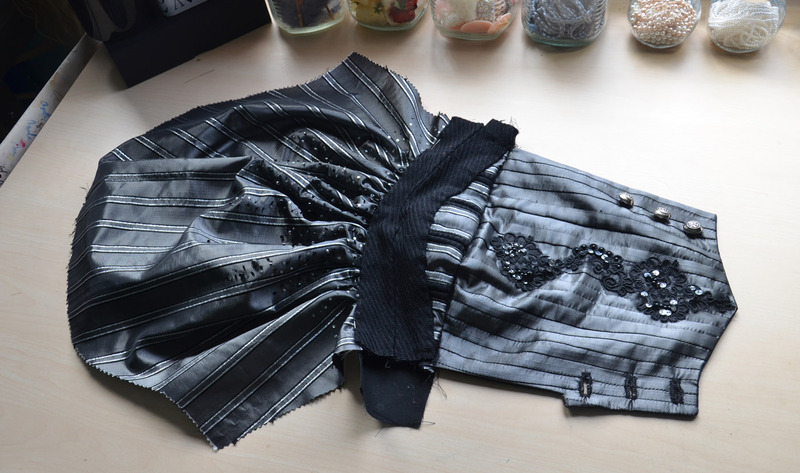 Part one is about the bodice and can be read here! I’ve run into some real roadblocks with this project, which i’m ignoring for the time being. 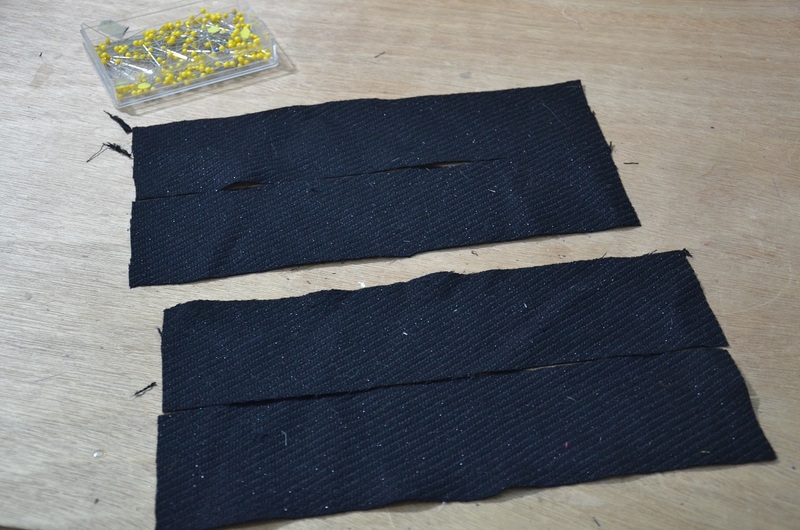 Instead i’m focusing on the parts that aren’t going too poorly, like the sleeves, which is what this post is all about. 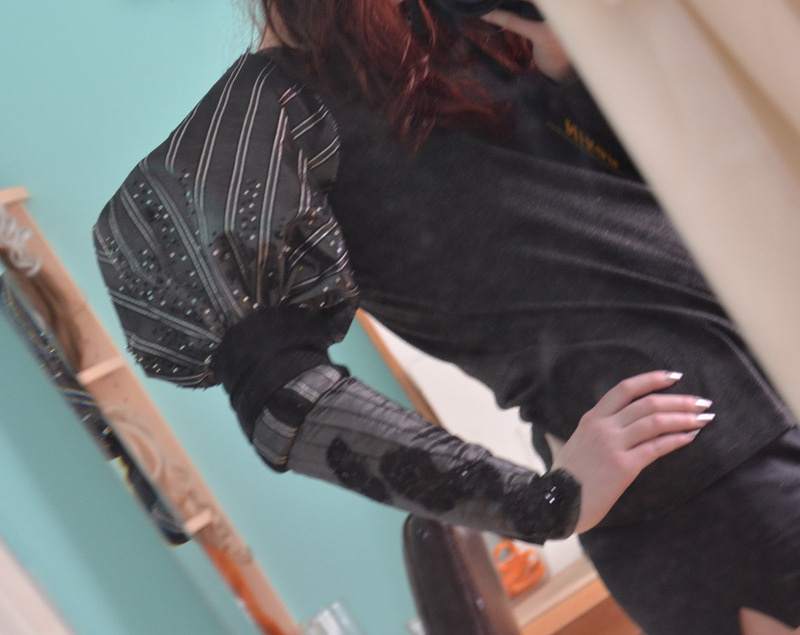 I debated a lot about how to make the sleeves on this thing. I really wanted to do puffy sleeves like the ones on my Glittery Gown but I knew I wanted the cape to have sleeves as well, which would cover the dress sleeves down to the elbow. So that meant the sleeves needed to be very collapsible. I couldn’t use batting or stuffing to make a base, but luckily taffeta is pretty stiff on it’s own and (should) be able to support itself. I finally decided on a design I liked, which looked like so! Then I translated those doodles and crap into a functional pattern. I used some super elegant mock up materials – I like how the green bubbles bring out the green in the guitars. There were some minor fit issues, all of which were in the wrist region. I didn’t like the crescent at the elbow either, it was too large. But I really loved how poofy the sleeve were, and the bands below them fit perfectly! 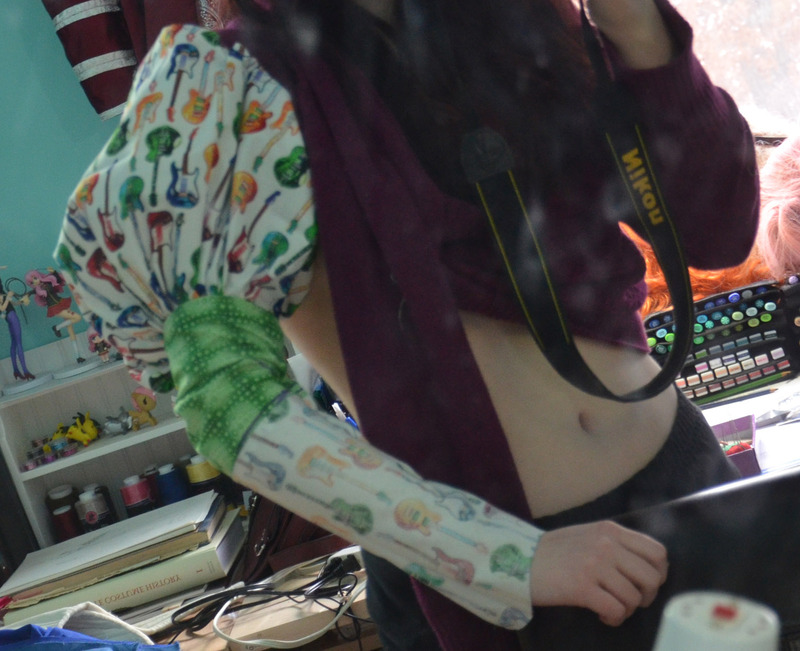 Then I gathered some embelishments to make the sleeves a little more interesting. 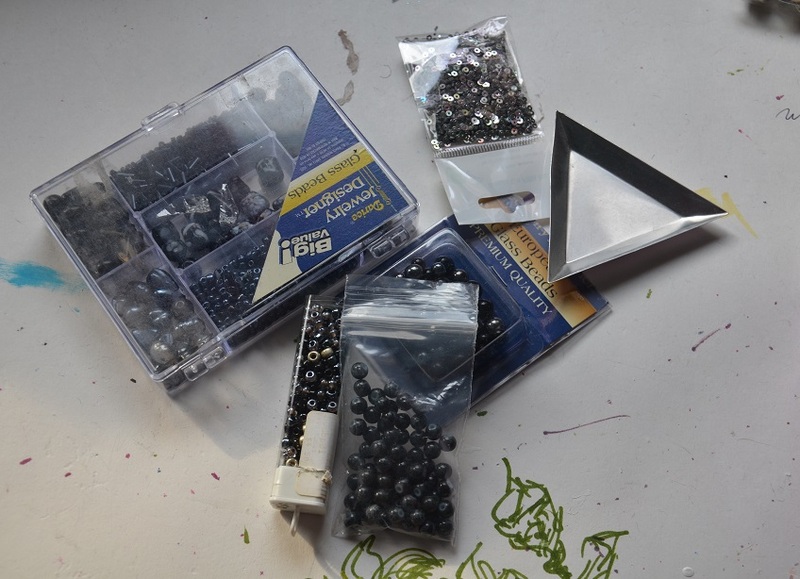 I raided my beading collection, which had to be dusted off since it hadn’t been touched in five years (oops). Most of the items were purchased when I was ten so it was a bit of a challenge to find anything in a color other then pink. But I did manage to find some fantastic, usable stuff! Then I got to work sewing those on. I sort of winged the pattern and hoped for the best. I didn’t really like how it looked but I decided to fake confidence and keep going. Luckily, once it was finished, I was quite fond of it. Once the poofy bits were done I moved down to the bands that surround them. 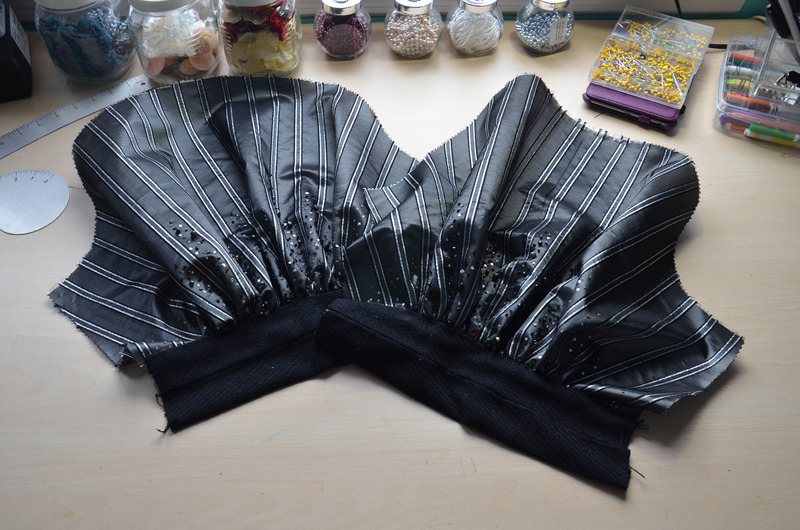 I made these much like the ones on the bodice, rectangles of fabric that were sewn into tubes and then hand sewn together. Then I gathered the lower edge of my poofy sleeves and sewed them together. Then I skipped over the elbow portion and moved on to the wrist pieces. 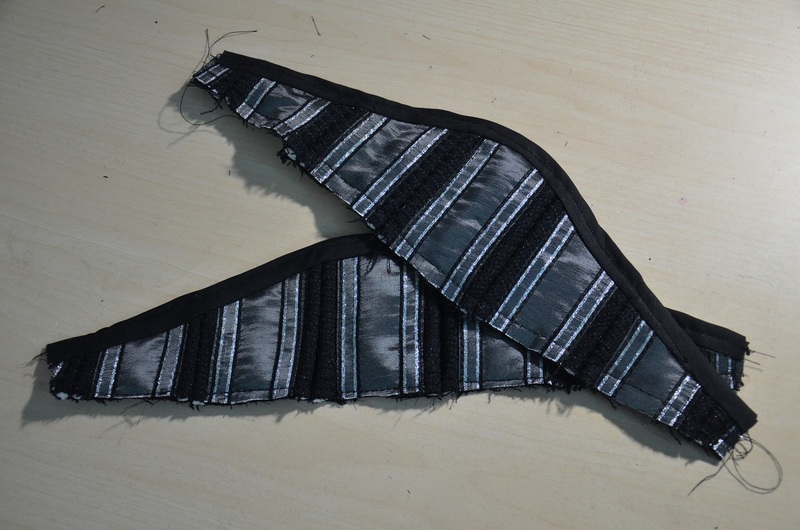 I knew I didn’t want the stripes to show on these pieces, so I decided to sew the stripes out of the fabric. 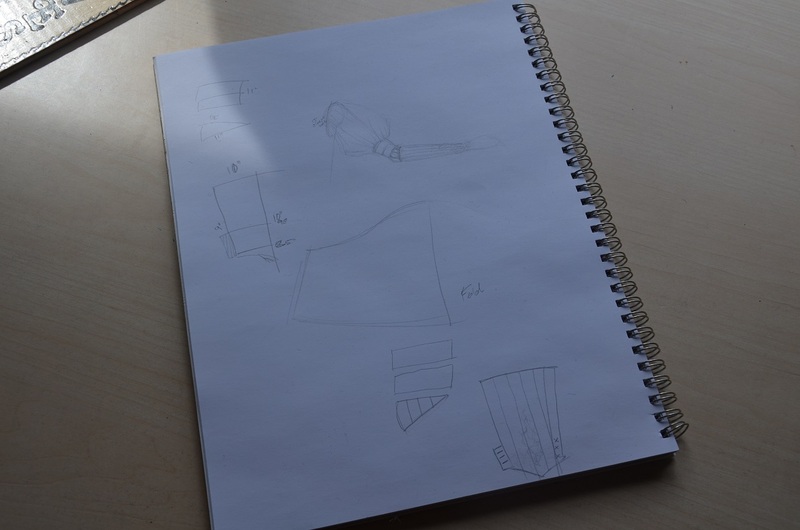 This would require sewing a lot of seams, but I figured if I did some carefully it could look really neat, and almost reminiscent of armor, which I like since this is (very) loosely based of of menswear. 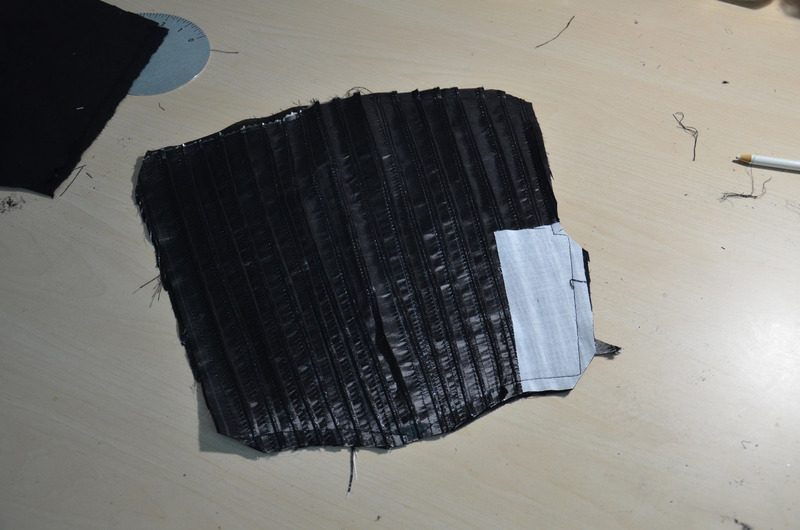 I started by marking out all the lines onto the back of the material. 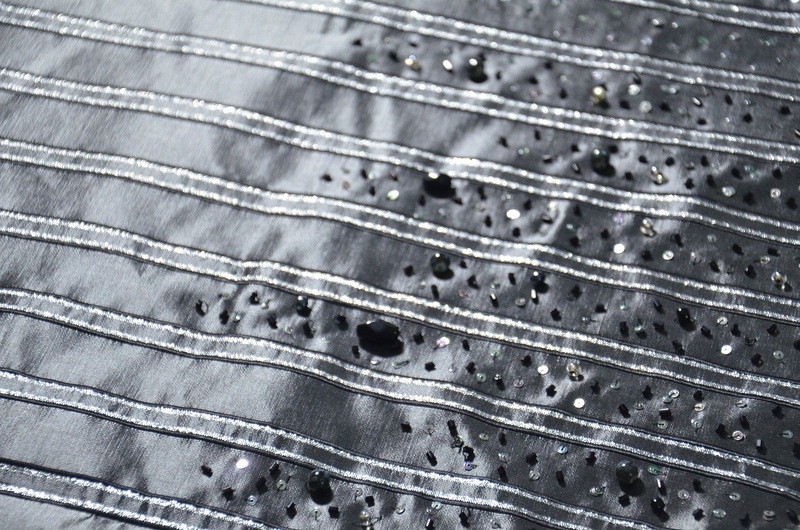 I had to fold the fabric at each stripe point, iron it, pin it, sew it, iron it, and then repeat. It was a very slow process but I adore the result! 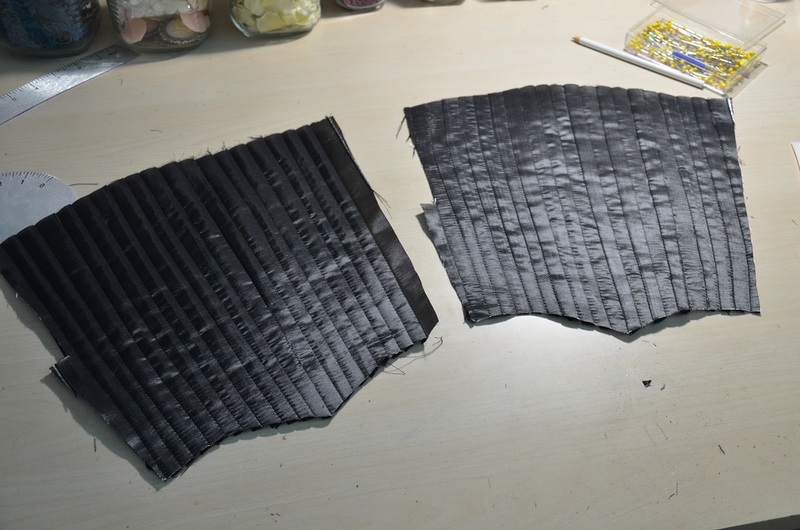 Then I cut my pattern out of my newly texture fabric, as well as black broadcloth (for lining) unfortunately I made a horrible mistake – I didn’t make sure my materials were right sides together when I was cutting. 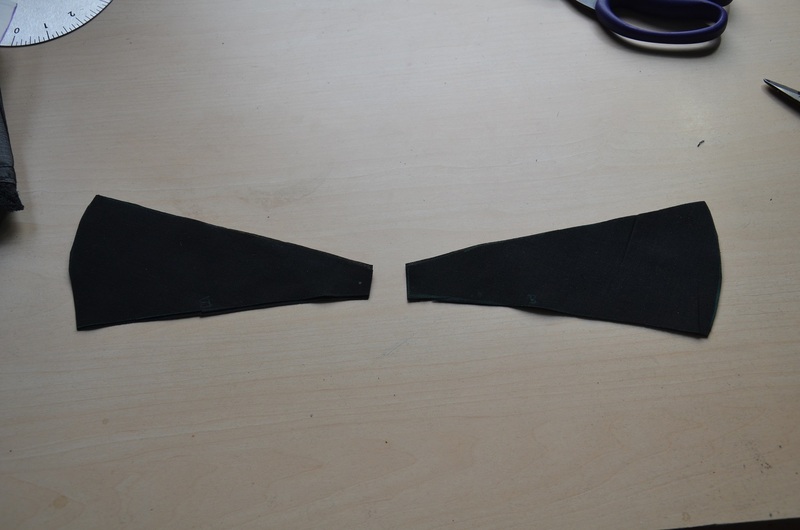 I cut two of the same pattern piece when they need to be mirror images of each other. Unfortunately I did not have any material left to fix it with – this entire dress is made from a little over a yard and a half of fabric, there was NO room for mistakes. I decided to ignore it (as best I could) and move on. 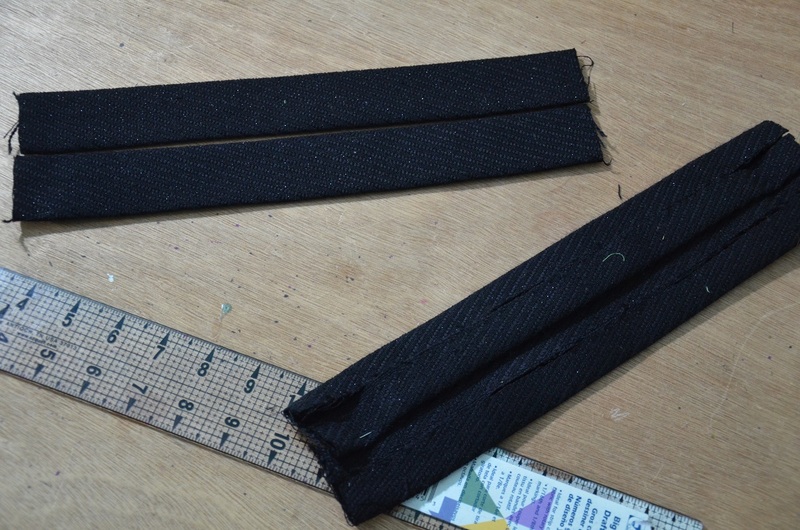 I added a bit of interfacing to the taffeta, to make sewing the button holes a bit easier later on. 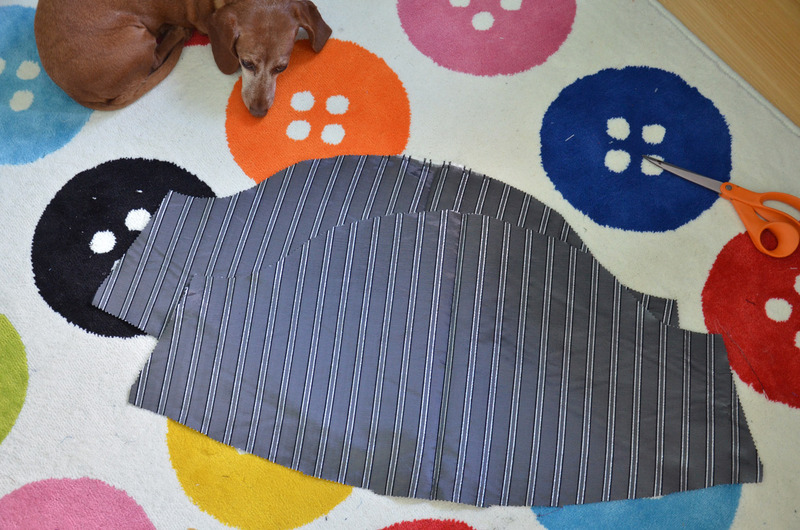 Then I sewed the lining in. I clipped the corners, turned it rightside out, and pinned the lace on. They aren’t perfectly symmetrical but i’m not bothered by it. 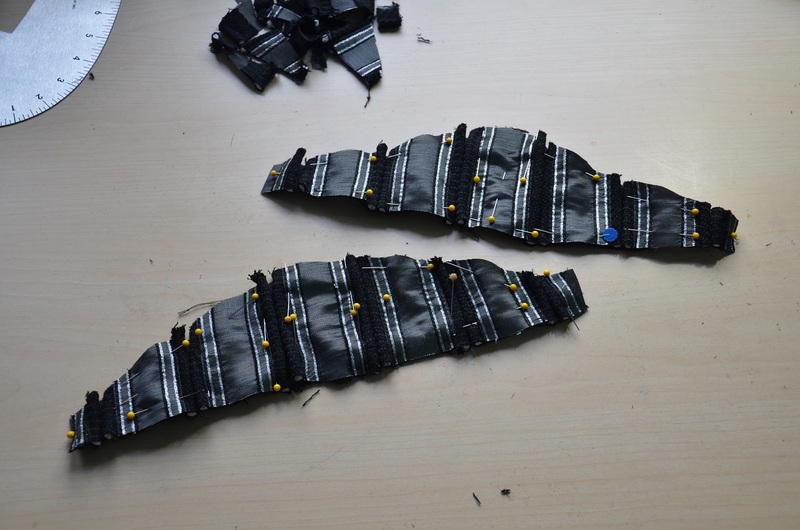 Then I sewed the button holes in, and the buttons on. These buttons are from this wonderful shop on etsy. The last bits were the elbow pieces. 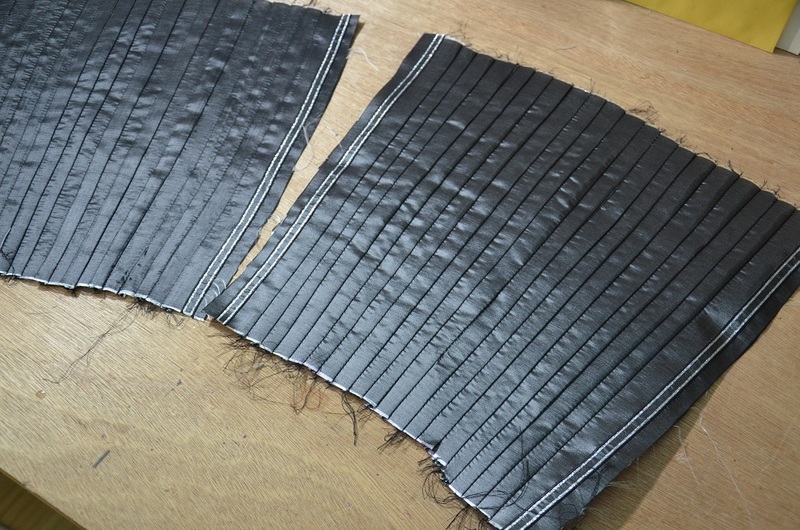 I started by cutting out the broadcloth bases and sewing them together. 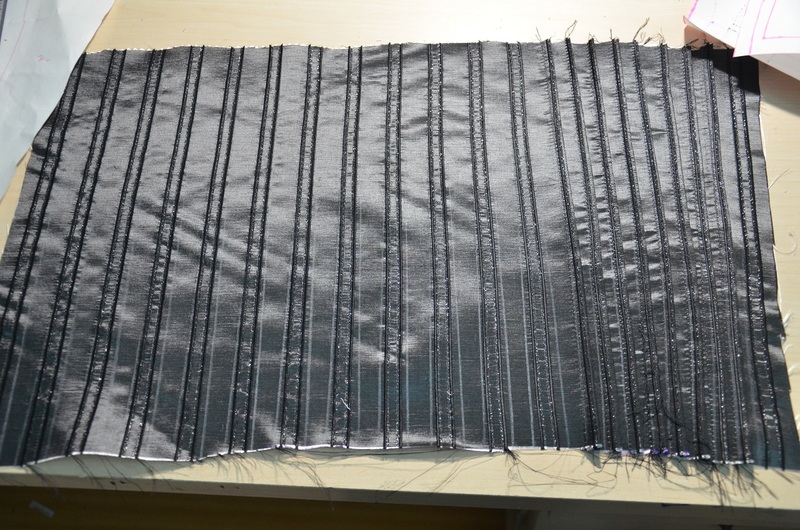 Then I made stripes of fabric to cover them – I talk about this technique in part one, so I won’t repeat myself in this post, instead I will just show you how it looks. 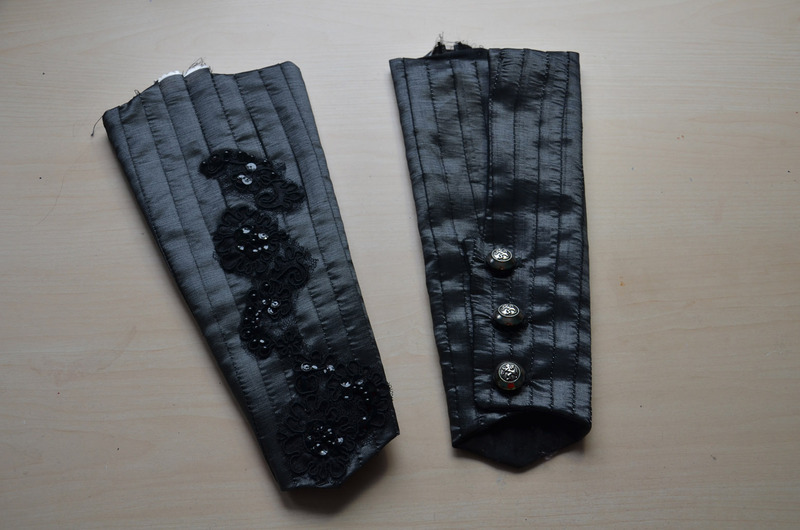 I sewed around them, then sewed bias tape onto the edges. And then I sewed all the pieces together! I sewed in the lining, stitched up the sides and my sleeves are officially DONE. 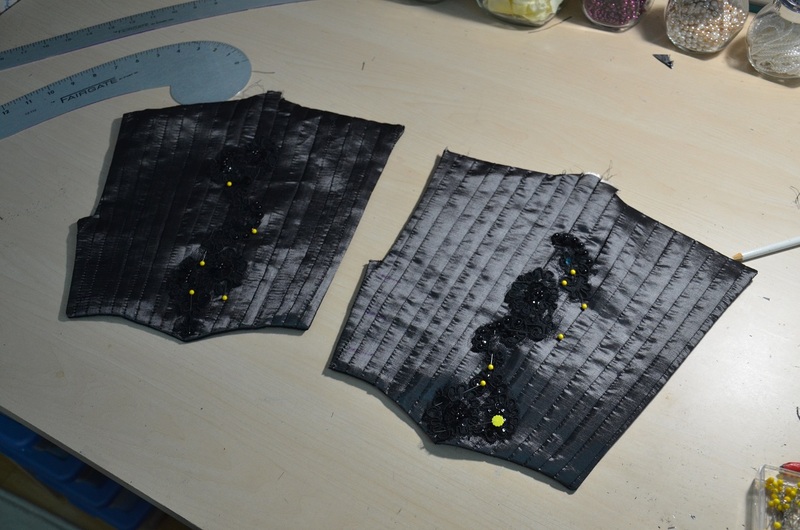 I just have to gather the tops and secure them to the bodice. 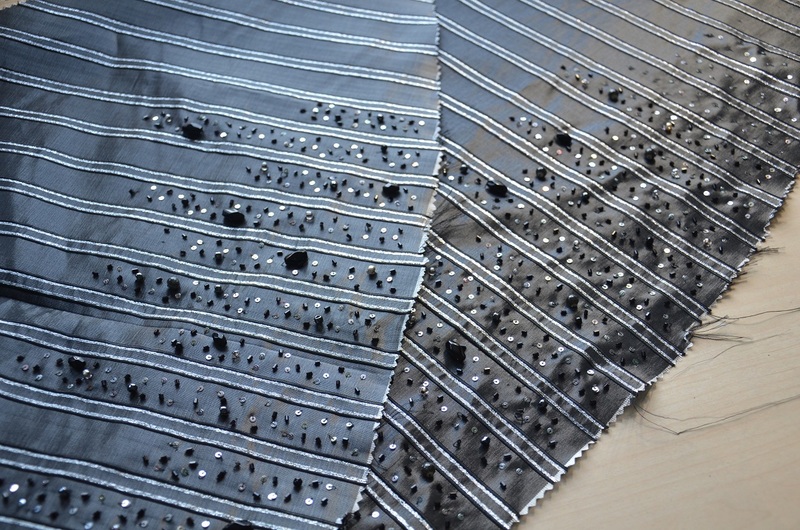 This dress is getting so close to completion – I really hope nothing else gets in the way of finishing it. I have the grates admiration of your tenacity in doing something with so much decoration, and that is just the sleeves! I really like how you demonstrate how you design and put together your fantastic creations!!!! I look forward to seeing your posts in my inbox!!! Thank you!!! But I have a question and it’s kinda starting to trouble me, how did you sew the wrist part of the sleeve? The triangle part. I don’t see any seam.